PM Studios and acttil have announced that the adventure/puzzle game collection OPUS Collection: The Day We Found Earth + Rocket of Whispers will be coming to Nintendo Switch in North America in a physical format in April 2019. 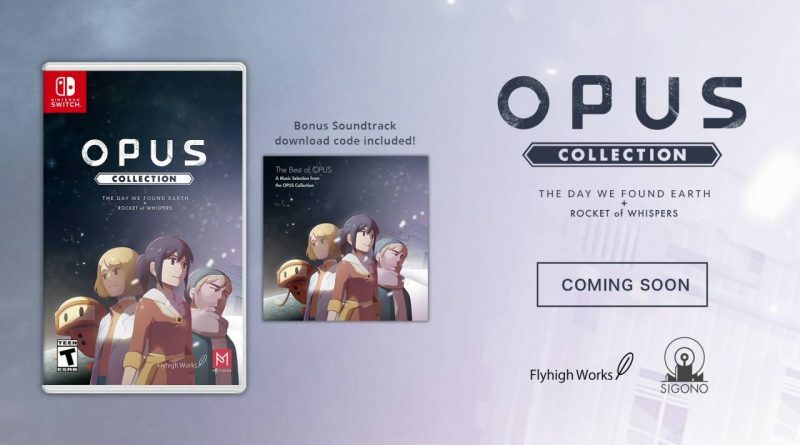 OPUS Collection will include both OPUS series titles, OPUS: The Day We Found Earth and OPUS: Rocket of Whispers, which were originally released as digital-only titles. Each copy will also include a free bonus soundtrack voucher code, including 36 tracks. In OPUS: The Day We Found Earth you’ll work together with Emeth to search for the long-lost planet known as “Earth”, while in OPUS: Rocket of Whispers you will attempt to return a planet’s lost souls to the cosmos where they belong. Millions of years in the future, mankind has left its home planet of Earth far behind. But now Emeth, an adorable robot who has made a solemn promise to his creator, must rediscover his lost homeland in order to save all of humanity. But as he tries to fulfill that promise, he begins to realize that he may hold an even greater purpose… This atmospheric, bittersweet tale is the perfect introduction to the world of OPUS. Operate a deep space telescope to scan the skies for long-lost Earth…and other untold secrets. Investigate your ship to uncover the history of a centuries-old mission item by mysterious item. Explore a universe teeming with vivid and vibrant planets, nebulas, and galaxies. Lose yourself in a sweeping soundtrack that will tug at your heartstrings. Witness the story of two lonely survivors of an apocalyptic plague, who are given the seemingly impossible task of building an interstellar rocket. Their goal is to revive the ancient tradition of space burial and return the lost souls of the world to their cosmic homeland. Written by the IMGA-nominated author of OPUS: The Day We Found Earth, this tale of loss and rebirth will leave you breathless. Travel through the ruins of a frozen world, uncovering the history of a once prosperous land as you go. Gather the materials you’ll need for your rocket, and craft tools to explore even greater distances. Uncover more than 100 items, each with unique artwork and descriptions informed by detailed research. Roam through a beautiful, atmospheric soundscape created by indiePlay-nominated composer Triodust.